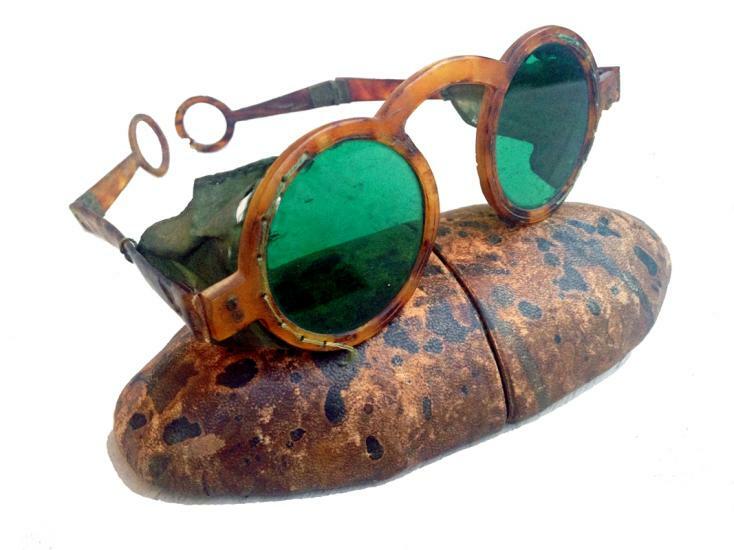 For the first time in eyeglass history, the exhibition “Spectacles Fit for a Doge”, which took place in Venice, gathered together spectacles from museums and private collections to trace a part of the history of eyeglasses and sunglasses. 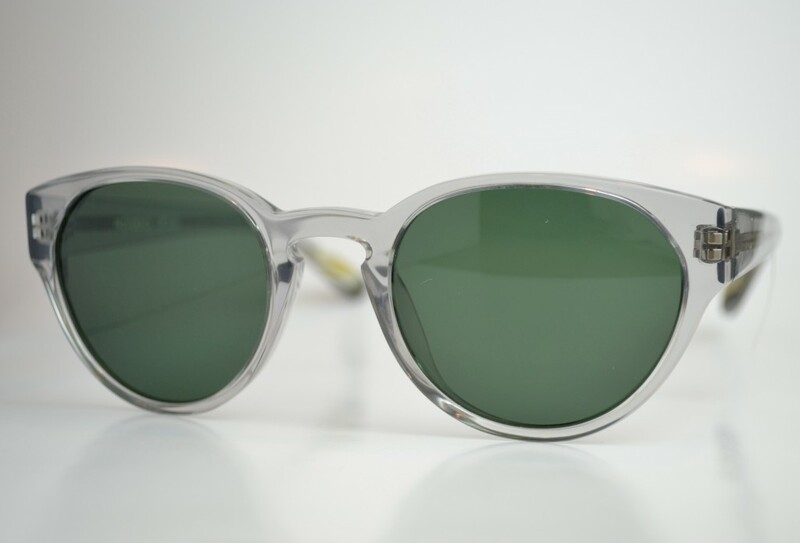 Detail of the groove and silk thread on these sunglasses made of very light-colored horn and green mineral lenses. 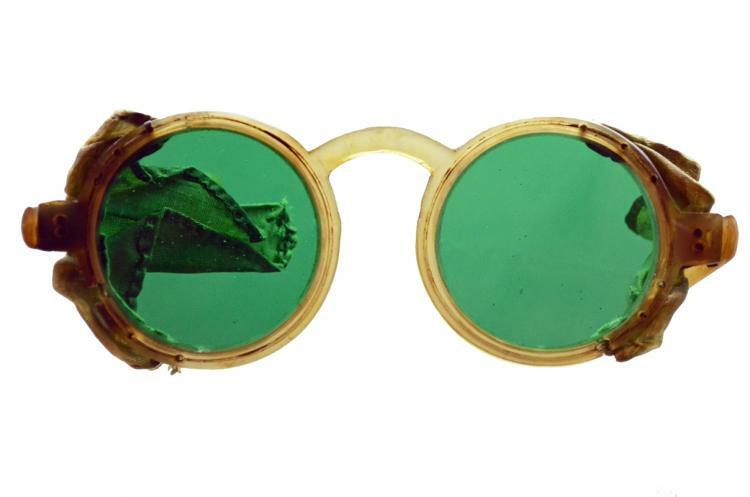 Venetian opticians, 120 years before the rest of the world discovered the danger of ultra-violet rays, produced emerald green color glass to create sunglasses that totally stopped these rays. During the 18th century in Venice, the nobility and Commanders da Mar (of the sea) wore sunglasses to protect their eyes from the glare of reflected light while navigating the waters of the lagoon or the open sea. Considering the good number of seventeenth-century eyeglasses now held in museums and private collections, we can say that the manufacturing of colored glass for protective purposes was widely practiced from the second half of the seventeenth century on. Knowledge about the composition and diffusion of light was still in its infancy, and it was not till the end of the 17th century that Isaac Newton (1642-1727) demonstrated that white light was made up of all the other colors. A few years later, the discovery of ultraviolet light (UV) took place in 1801, still several decades before its dangerous properties were finally recognized in 1870. Goldoni-type eyeglasses o Case with double temple pieces. 18th century. Green was the most commonly used color, which was produced in various shades: yellow-green, meadow-green, sea green and emerald green. Made in furnaces on Murano, this unmistakable glass allows us today to distinguish between factory-made goods and those made by Venetian opticians in the past. In the 20th century, green lenses were formulated to create G15, which were first used to reduce the amount of glare and increase comfort for pilots. G15 meant that there was only 15% of light transmission through the lens while it blocked UV reds and UVB rays. It wasn’t long before the popularity of this color spread from pilots to anyone with an outdoor lifestyle. We have taken into consideration the history of this color while designing our own line of eyewear. Fran by Providence Optical in Crystal Gray. Watch our exclusive interview with Garrett Leight. At OPTI Munich 2016 we meet with Lea Huch, recent graduate of design academy in Berlin. Her company PROJECT SAMSEN (both S pronounced as Z) named after her grandmother, who was an optician. The eyewear line 001 is 3D printed laser sintered one-piece Monoframe with screwless hinge. 5 styles, named ABCDE, 5 colors. Sunglasses come with Carl Zeiss lenses, providing an excellent UV protection and scratch protection. 001 eyeglasses are extremely flexible, lightweight and durable. Available at Providence Optical in spring 2016.